Y Gallery’s latest show, exhibiting February 9 – March 6, 2012, presents work by Ray Smith and G.T. Pellizzi, two Mexican-American artists of different heritages, but common cultural backgrounds. The Execution of Maximilian: Border Paintings is an account of the daily violence encountered on the US/Mexico border, the treatment of illegal immigrants, and the economic strife of Mexican border cities created by border policy. Smith and Pellizzi’s method in creating the work for this show is a reflection of this misfortune and violence— they were executed by shooting at cans of colorful paint with shotguns, on the Texan border wall of Mexico near Brownsville. 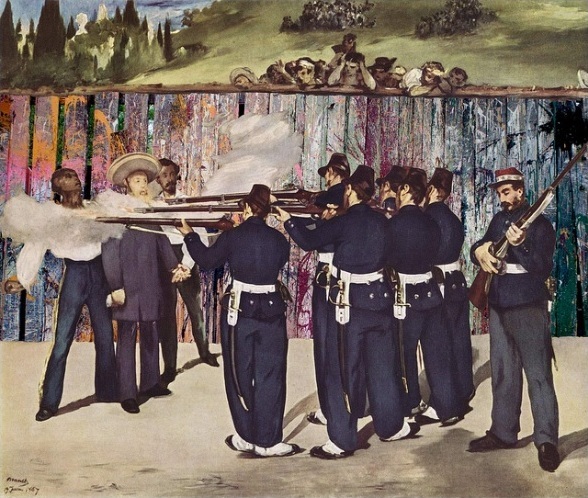 The paintings are based on Eduard Manet’s series of paintings from 1867, The Execution of Emperor Maximilian, one of the earlier depictions of contemporary politics. Manet’s The Execution of Emperor Maximilian depicts the death of the then Habsburg-Lorraine Emperor of Mexico, who had been placed in power by Napoleon III. Maximilian was executed by Benito Juarez’s republican army in an attempt to drive Europe out of Mexico. In some versions of Manet’s series, onlookers hitch up onto the walls to catch sight of the execution, as if it were a spectacle. In most versions, Emperor Maximilian is hardly seen and all of the focus is around the executioners and the onlookers. The series of paintings was not shown in Paris at the time due to its politically subversive nature. One of them was destroyed and exists only in fragments. 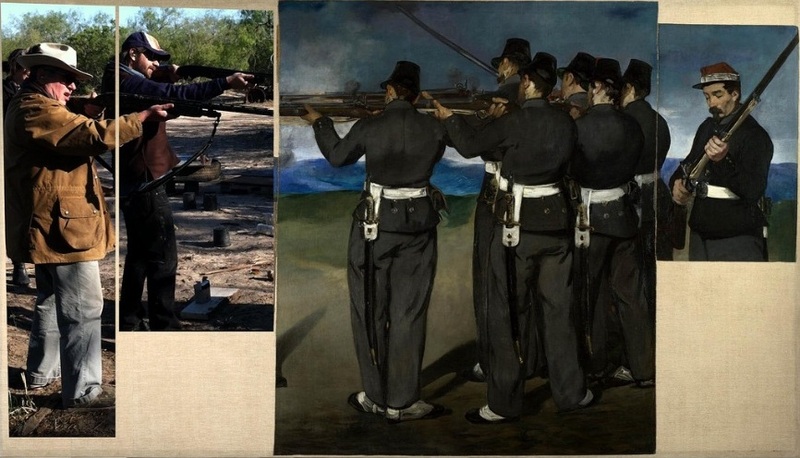 Like Manet’s, Smith and Pellizzi’s series are a contemporary look at how a foreign superpower has affected Mexican identity, especially that of those living on the border, a region which once belonged to Mexico, then to the Spanish, then redefined and given partly to the independent state of Texas, now part of the United States. When the political figures are removed, there is only a clash between armed forces and civilians as they take sides or simply conform to the lifestyle created by the circumstances. Smith and Pellizzi capture this moment in the tradition of “action painting”, only this time, using deadly weaponry as the brush.